Front page full color banner available for $200. Ads are approximately 2 inches x 2 inches. There is no guarantee placement of ads. Changes can be made at any time. Card of Thanks - 20¢ per word. Minimum $6. Deadline: Thursday at 5 p.m. Contact us today to get in touch with one of our advertising specialists to learn about our effective and affordable advertising solutions. Our Rate Card: Local. Affordable. Effective. Reach local shoppers in and around Bottineau County. 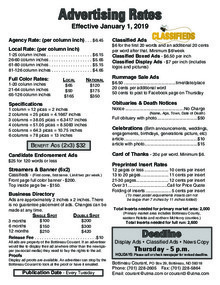 Advertise your business in the Bottineau Courant. Download "Bottineau Courant rate card 2019.pdf"